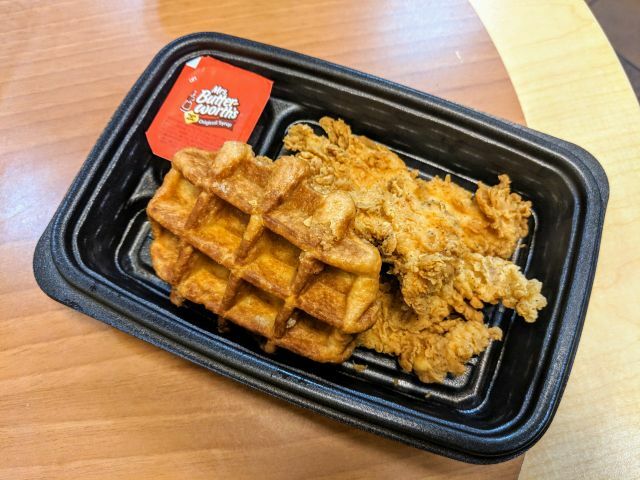 KFC's Chicken and Waffles pairs a new liege Belgian waffle with three Extra Crispy chicken tenders (you can also opt for a leg and thigh or breast). A cup of Mrs. Buttersworth's syrup is also included. 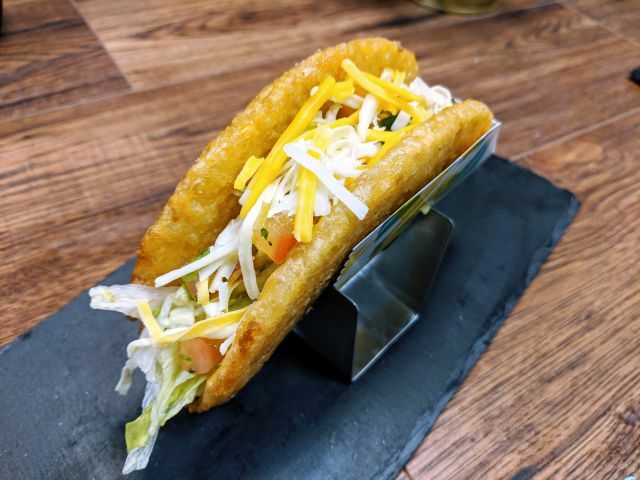 I paid $5.49 for an order. 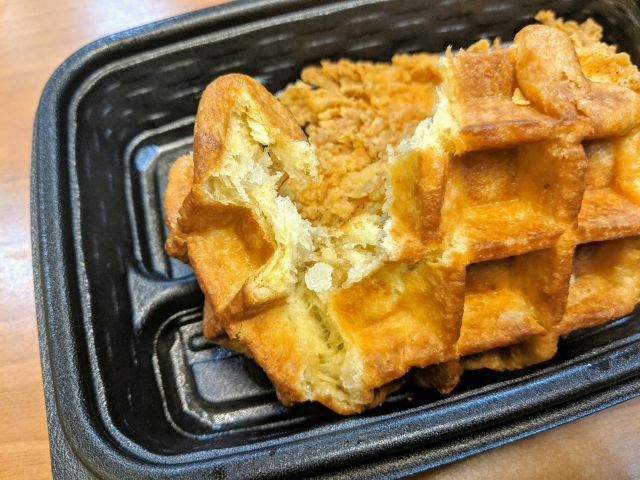 The waffle was warm and relatively crispy on the outside. Liege waffles are made with yeast-risen dough rather than batter and aren't as fluffy as a regular waffle. Inside, the waffle was slightly chewy with some uneven dry areas. The waffle comes with pearl sugar baked into the dough. It's supposed to caramelize for an extra crunch and flavor but, at least with my particular waffle, that didn't happen at all which left me with sizable chunks of granulated sugar. Despite the sugar pieces, the waffle was only mildly sweet so that you can still safely add some syrup to it. While the waffle turned out just okay, the chicken tenders came out well. They were crispy but still moist inside. With the lack of heavy seasoning, I don't mind them dipped in some of the maple-y syrup. 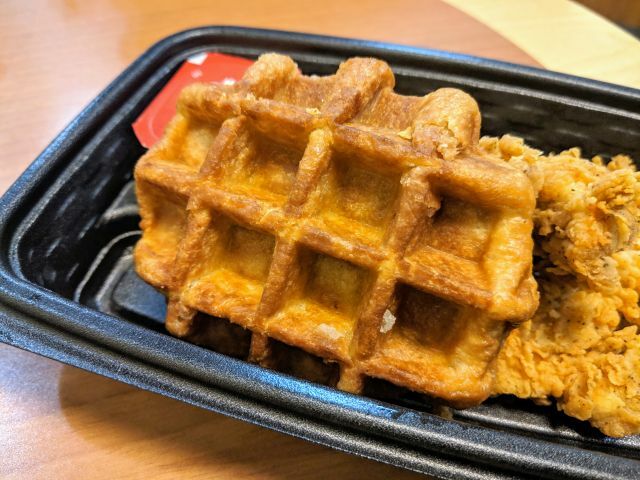 Taken together, KFC's Chicken and Waffles don't make for a spectacular combination but work well enough if you're looking for some sweet and savory action. The waffle is about grocery store level quality but is reasonably priced given that it'll cost you about $3 at the supermarket and you'd still have to toast it.